“Given the necessity for ships in exploration as well as the likelihood that those ships could get set on fire in ship combat, it would probably be useful to have rules for ship combat in the Exploration Age Campaign Guide.” John Fischer, creator and player of Oruk the half-orc mage. I have a Forgotten Realms game I’m running using the final D&D Next playtest packet, not the basic rules. We didn’t switch over yet, since our story is close to done and the party includes a monk, a bard, a druid, and three half-orcs – none of which are included in the basic rules. I asked my players if they wanted to start over and they preferred I not leave their current characters sailing off the Sword Coast in pursuit of pirates, forever wondering about their fate. So last Monday they finally met those pirates and we had a battle on the high seas! Both boats had cannons and crew wielding firearms using the rules I had posted earlier this year. Both boats also had spellcasters shooting fireballs at one another, with sails and wood catching aflame. I winged the rules for ship combat and fire on the fly, and it went ok. Clearly though, I had some work to do considering the comment I got from John (because his opinion and criticism mean much to me). Now I’m going to present some optional rules for you which John and I created together for the Exploration Age Campaign Guide. Check it out! Seriously, how great are paintings of ships? There are several ship offerings in the Player’s Handbook. Take a look at the chart below for a list of boats and their game statistics. Boat AC HP Speed Minimum Required Crew Number of Masts Cannons Per Side Sink Rounds See Notes? AC, HP, and Resistances. All ships have an Armor Class, Hit Points, and are resistant to all damage from nonmagical weapons which are not siege weapons. Minimum Crew Required. This number on the chart above is the number of sailors with proficiency in vehicles (water or air) required to keep a ship moving. During their turns, these crewmen can do nothing with their action other than tasks which keep the ship moving, such as rowing or sailing. Most ships bring on at least double, if not triple, the number of required crew so that they can share shifts during travel and have extra hands during combat to work siege weapons and board enemy vessels. One of these crewmen is considered the captain, who decides where and how the ship moves. The captain’s proficiency bonus and relevant ability modifier is applied to any checks required to control the vehicle in difficult circumstances. Unmanned. When a vessel does not have the minimum number of crew using their actions to keep the ship moving, it is considered unmanned. If the vessel is anchored before this occurs, the ship stays where it is. If no anchor was dropped, the boat is adrift and subject to the wind and water currents at the GM’s discretion. The captain can no longer choose the direction of the ship. In general a strong water or water current might move a ship 40 ft. per round, a medium current might move it 30 ft., and a light current might move it 20 ft. per round. Sometimes there may be no current or little current and a boat may stay in its place. Cannons Per Side. This is the number of cannons that can reasonably fit on the port and starboard sides of a ship with the space for the siege weapon crew to use them without getting in each other’s way. Some larger ships, like the warship or galley may be outfitted with a single cannon on the fore and aft decks. In order to attack a creature or object with a siege weapon aboard a ship, the appropriate side of the ship must be facing the target. Sinking. When a ship’s Hit Points reach 0 or less, it begins to sink. When it begins sinking, there is a 50% chance that the ship may tilt in a random direction (the GM decides or rolls 1d4 to see if the ship tilts and sinks aft first, fore first, starboard first, or port first). Creatures must make a DC 15 Dexterity saving throw to hang onto a fixed, adjacent object or be thrown overboard. The ship stays in this position while sinking. A sinking ship can still be attacked and dealt damage. Obliteration. If a ship’s Hit Points reach negative their max HP, the ship is obliterated. The vessel is completely destroyed and its cargo and crew find themselves in the water. Repairs. A damaged ship cannot have its Hit Points restored the way a creature can, since it is an object. In general, ship repairs cost 5 gp per 1 HP restored and take a number of hours to complete equal to the number of Hit Points restored. Rowboat. The rowboat is so small that siege weapons (such as cannons) have disadvantage when attacking a manned vessel. A rowboat’s crew need not be proficient in vehicles (water) to move the ship. Longship. If a longship dips below its required crew of 26, it does not suffer normal unmanned conditions. Instead, the ship begins moving at a speed of 15 feet, as it is rowed. A longship being rowed is considered unmanned when it has less than 13 crew. A longship has one sail which it can use to move with a speed of 10 ft. If the longship has less than 5 crew and is being sailed, it is considered unmanned. Unless it is sailing, a longship’s crew need not be proficient in vehicles (water) in order for it to move. Galley. If a galley dips below its required crew of 120, it does not suffer normal unmanned conditions. Instead, the ship begins moving at a speed of 25 feet, as it is rowed. A galley being rowed is considered unmanned when it has less than 60 crew. A galley can be sailed instead of rowed and move at a speed of 30 ft. If the galley has less than 20 crew and is being sailed, it is considered unmanned. Unless it is sailing, a galley’s crew need not be proficient in vehicles (water) in order for it to move. Airship. An airship is a magic, flying warship, which is propelled by the elemental force of lightning. An airship does not sink. Rather, the vessel and every creature aboard it without a fly speed begins to fall per normal falling rules when its Hit Points are reduced to 0 or less. From D&D Basic rules – the price of boats! Seriously, how great are paintings of boats on fire? Ships are vehicles which are difficult to control under the best circumstances. They are also surprisingly delicate when it comes to their masts and fire. When it comes to turning a ship, the larger it is, the less mobile. Most ships can turn no more than 90 degrees in one direction during a move. Longships, warships, and galleys can turn no more than 45 degrees in one direction during a move. Row boats, longships being rowed, and galleys being rowed can move backwards. In order to change direction from forwards to backwards and vice versa, the vessel must spend one turn still in the water, steadying. On its next turn the vessel may move backwards or forwards as the captain chooses. 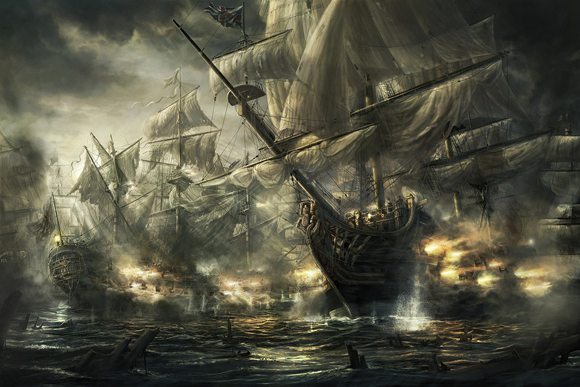 Masts of a ship can be singled out and attacked. A mast has one-tenth the hit points of the entire vessel. Any damage a mast takes, the vessel also takes as a whole. Siege weapons have disadvantage on attacks against masts. If a ship’s mast is destroyed and it is being sailed, its speed is reduced by 10 feet. Once all of a ships masts are destroyed, the vessel is considered unmanned, unless it can be rowed. Certain siege weapons, spells, and magic items have the potential to light a vessel on fire, though many seafaring vessels are crudely fire-proofed. When a vessel is dealt fire damage, there is a 20% chance the area of the ship affected by the attack will light on fire. Every round at the top of initiative, the fire deals 1d6 (3) fire damage to the vessel for every 25 square feet of the ship which is on fire (rounded down). After the damage is dealt, there is a 50% chance the fire spreads 5 feet in a random direction determined by the GM (consider the wind when using thinking about spreading fire, or roll a d8 to determine the direction the blaze moves). A creature can use its action to put out a 5 x 5 foot area of fire, using an object to smother the flames (such as a tarp or blanket) or a gallon of water to extinguish the blaze (the water is consumed in this action and more must be obtained before the creature can put out more fire). Certain spells, such as create water, have the ability to quench fires in their description. Any spell which deals cold damage can be used to extinguish an area of fire equal to the spell’s area of effect. If the spell deals cold damage and attacks a single target, like ray of frost, then it can be used to extinguish a 5 x 5 foot area of fire. Alchemist’s paint is a special, clear substance which can be applied to wooden vessels to prevent them from catching on fire. It does not come cheap, however. A barrel of the stuff costs 1,000 gp and is enough to cover a single rowboat. Alchemist’s paint not only prevents fires from breaking out on boats, it also gives a vessel resistance to fire damage. The benefits of alchemist’s paint last one year. Below is a table which gives the number of barrels of alchemist’s paint required to completely coat a vessel. Each barrel takes one creature one day of work to apply. Multiple creatures can paint a vessel at once, decreasing the time it takes to fire-proof a ship.